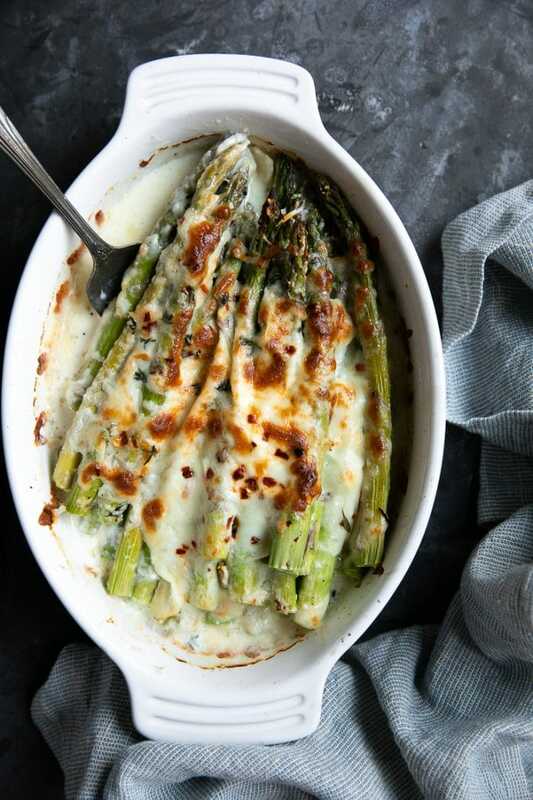 Made with a handful of simple ingredients like fresh garlic, cream, and two kinds of cheese, this Cheesy Baked Asparagus Gratin is rich, creamy, and super easy to prepare. Enjoy this delicious Baked Asparagus Recipe with your favorite dinner or as a side at your next holiday gathering. This is, hands down, the most delicious baked asparagus recipe you will ever make. 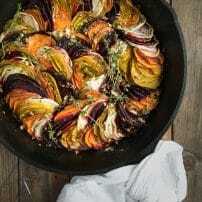 In fact, I may even go so far as to say it’s one of my top five favorite side dishes. 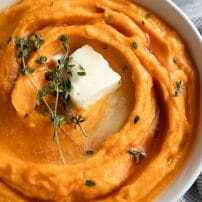 Right up there with these Mashed Sweet Potatoes, creamed corn, shredded Brussels sprout and kale salad, and glazed carrots. 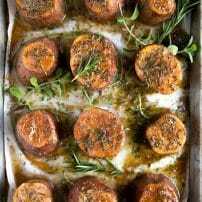 If you’re looking for a fast and delicious side dish recipe to serve for the holidays or with your favorite baked chicken, you’ll love this. 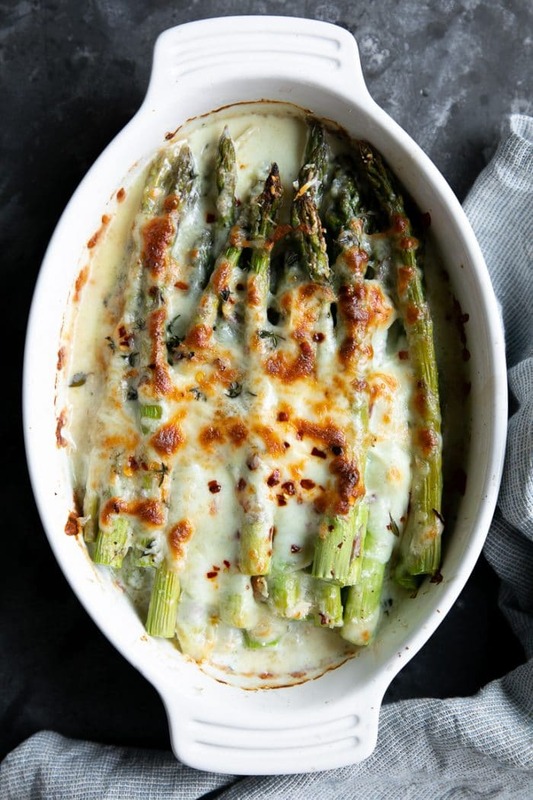 What is the best cheese for this Baked Asparagus Gratin Recipe? You’ll notice that I used mozzarella cheese and Parmesan cheese in this recipe. I choose mozzarella because it’s a fantastic melting cheese (pizza, anyone?) and pretty mild in flavor. Parmesan, on the other hand, is much bolder in flavor (one of my favorites) and, like mozzarella, is readily available at all supermarkets. Lucky for all of us food-loving people, this is one seriously easy recipe. 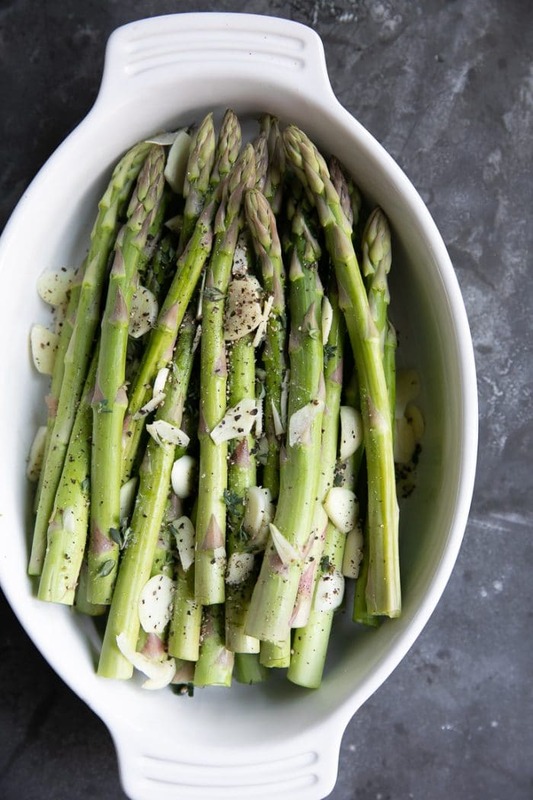 Preheat oven to 400 degrees F. Transfer asparagus to an oval 9″x13″ baking dish and toss with the slivered garlic, salt, pepper, red pepper flakes, and fresh thyme. Drizzle the heavy cream over the asparagus and sprinkle with the mozzarella and Parmesan cheese. Transfer to the oven and bake for approximately 20 minutes. Set oven to broil. Allow the asparagus to broil for 1-2 minutes or until golden and bubbly. Remove from the oven and allow to cool for 1 minute. Best enjoyed immediately. In other words, dump everything in an oval baking dish and bake until asparagus is tender and cheese is bubbly. It’s the perfect harmony of healthy baked with guilty, creamy, cheesy goodness. The garlic. Yes, my friends. Keep a pack of gum or breath mints nearby because there is a lot of garlic in this mighty side dish and it is worth every last clove. Prep takes just 5 minutes! Speaking of prep…you can easily prepare this side dish ahead of time and pop it in the oven 20 minutes before dinnertime. Your kid may just learn to love asparagus…but don’t take my word for it, my child still refuses to come anywhere near the stuff. Which reminds me- not a fan of asparagus? Try green beans instead! 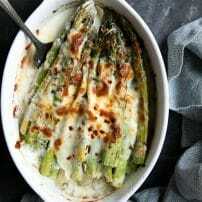 If you try making this Cheesy Baked Asparagus Gratin Recipe, please leave me a comment and let me know! I always love to read your thoughts and feedback! DON’T FORGET TO PIN AND SHARE THIS BAKED ASPARAGUS RECIPE FOR AN EASY AND FLAVORFUL DINNER OR HOLIDAY SIDE DISH. Made with a handful of simple ingredients like fresh garlic, cream, and two kinds of cheese, this Cheesy Baked Asparagus Gratin is rich, creamy, and super easy to prepare. Preheat oven to 400 degrees F. Transfer asparagus to an oval 9"x13" baking dish. Sprinkle with the slivered garlic, salt, pepper, red pepper flakes, and fresh thyme. Gently toss the asparagus to distribute the garlic evenly among the layered asparagus spears. 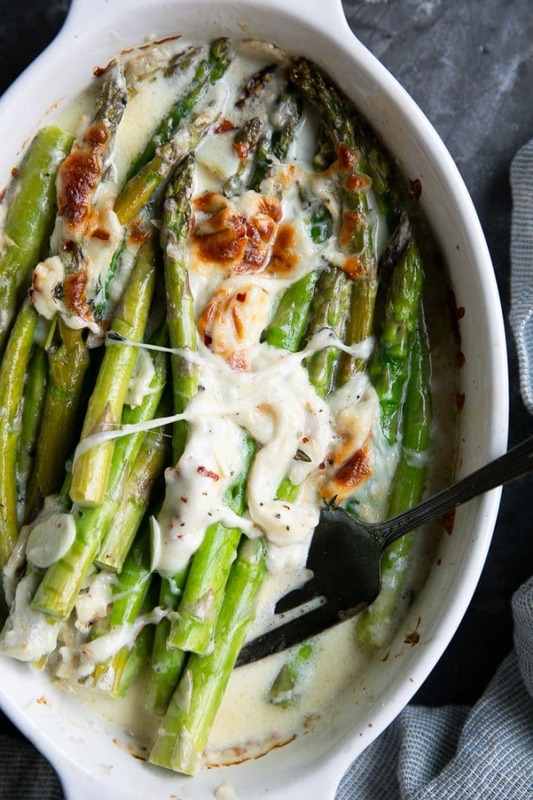 Drizzle the heavy cream over the asparagus and sprinkle with the mozzarella and Parmesan cheese. Gently shuffle the asparagus spears to distribute some of the cheese among the lower layers of the asparagus. Transfer to the oven and bake for approximately 20 minutes, or until asparagus spears are tender and cheese is melted. Set oven to broil. Allow the cheese to broil for 1-2 minutes or until golden and bubbly. Remove from the oven and allow to cool for 1 minute. Best enjoyed immediately. Feel free to substitute the heavy whipping cream with half and half, if desired. This was way too much garlic, it gave the dish a burnt taste. The asparagus was not at all tender, perhaps you should pat boil it or something.